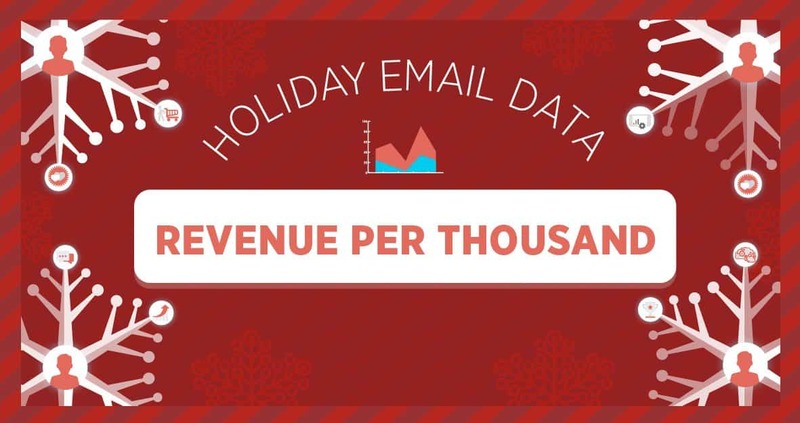 This is part 3 in the 3-part blog series on the holiday email benchmarks that matter. Read the previous posts on Click-to-open Rate and Average Order Value. Revenue per thousand, often referred to as RPM (yes, not “t” for thousand, but “m”! ), is a metric most commonly seen in advertising. Advertisers and tools like AdSense use RPM to evaluate how much revenue was generated for every 1,000 ad impressions served. While it’s traditionally been seen as an ad metric, more and more companies are beginning to use RPM as a way to evaluate the performance of many marketing channels, especially email. For email, the metric is pretty self explanatory: how much revenue was generated per 1,000 emails delivered? It can be extended for pageviews, and other key user interaction points depending on the brand. During the holidays, RPM is an extremely powerful metric to pay attention to. Aside from how profitable your customers’ basket sizes are, RPM shows you how well your entire customer base is responding–and more importantly purchasing–from your email marketing efforts. Based on our analysis of more than 475mm ecommerce emails from 2013, email marketing is most effective at driving RPM leading up to and during holiday prime time, which coincides with Black Friday and Cyber Monday. RPM peaked on Black Friday and dropped by 18.33% on Cyber Monday. We view this drop as being driven by sales and discounts offered via email specifically on Cyber Monday, as this date is now synonymous with discounted online shopping. RPM has a big surge during this time period from a couple of factors but is largely driven by the increased conversion rate since people are so motivated to make purchases. We see a peak in conversion rate during this time because many retailers offer much deeper discounts than they would normally send. AOV also peaking during this week is a signal that marketers are converting users without eroding revenue potential by requiring a minimum order value to qualify for the discount (i.e. Save 20% by spending $200). After the surge on Black Friday, RPM continued to drop following Cyber Monday and decline steadily thereafter, until finally picking back up again on December 14th and 15th, giving further validation to assumption that customers prefer to shop on weekends. We expect that the RPM decrease on Cyber Monday will become even more dramatic, with the rise of the “Cyber Saturday”. The trends appears to be that customers prefer to do their bulk holiday shopping on the weekend vs. weekday, and 2013 data shows us this behavior curve. Industry analysts are expecting significant revenue growth in online shopping this year, and with that, we can expect YoY RPM to be higher than last year’s for most ecommerce brands.